Integrating front- and back-office operations is becoming an increasingly high priority for corporate executives, with more than three-fourths reporting that it is important, according to a recent study. 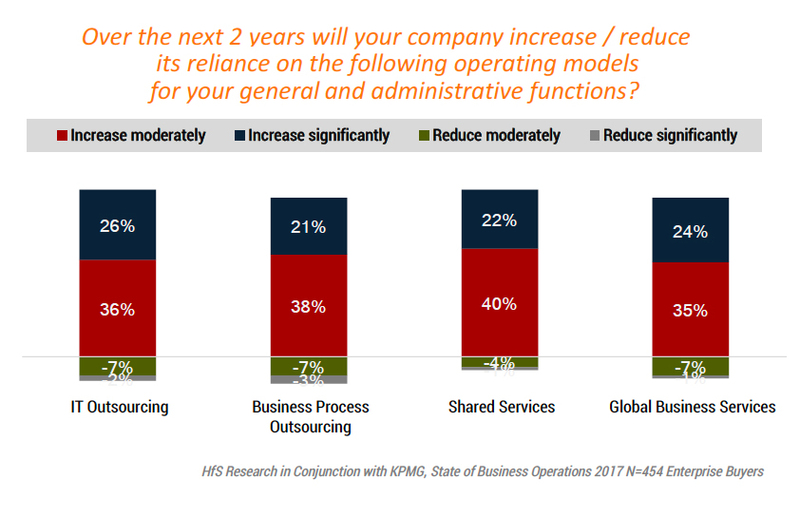 Nearly one-third (31%) of those responding to the HfS Research/KPMG report “State of Operations and Outsourcing 2017” survey even go so far as to call this a “mission critical” element of modern business strategy, with digitalization being the key avenue to achieving the goal. Though cost savings remain important as well, this shifting landscape highlights the need for business process outsourcing (BPO) providers to offer more than labor arbitrage. The executives surveyed in the study are now looking for partners that can help in this transformation by contributing to strategic integration — not just handling low-level tasks. They want providers with sourcing strategies that can help knock down silos, enhance the organization’s overall customer experience, and align with what the study authors call a “One Office” mentality to getting the job done. But the numbers show that this doesn’t mean that firms are looking to decrease their reliance on BPO, shared services, and other outsourcing. On the contrary, nearly two-thirds of companies say they will increase their reliance on both IT outsourcing (62%) and BPO (59%) over the next two years. But this comes with the assumption of added value and increasing digital capabilities. “Digital organizations can work in real-time to cater to clients, where intelligence, processes, and infrastructure come together as one integrated unit, with one set of unified business outcomes — on a unified business infrastructure tied to exceeding customer expectations,” wrote KPMG. Phil Fersht, CEO of research firm HfS Research, agrees and stresses that this new reality is right around the corner — if not here already. So he advises providers to stop thinking about front office and back office as distinct functions. Rather, the goal should be doing whatever it takes, in all areas of operations, to improve the digital customer experience going forward.